Being Frugal and Making It Work: FREE Smart Thermometer at Swagbucks! FREE Smart Thermometer at Swagbucks! If you're a parent, you know how important it is to be prepared for your kid's next fever. We try to always keep them healthy, but a sick day now and again is inevitable. Keeping a small supply of electrolyte fluids, maybe some Jell-o or Popsicles, kid-safe fever reducers, and, of course, a thermometer for the next sick day is second nature to many of us. But, while that pack of Jell-o might last forever in your cupboard, it's probably time you upgraded to a thermometer that's built for our modern lives. 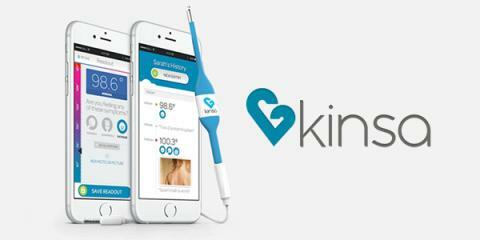 Kinsa is a company that specializes in this new breed of "Smart" thermometers, that interact with your smartphone to document your child's temperature over time and help you make decisions about whether a good nights sleep and a cold towel will do, or if it's time to check in with your pediatrician. Simply plug the Kinsa Smart Thermometer into your phone's headphone jack (either on its own or with an optional extension cord) and launch their free app to see how Kinsa will work for you. The app has interactive games for kids to stay engaged and patient while the thermometer delivers an accurate reading, and by using your smartphone, Kinsa takes advantage of 25,000X the processing power of a regular digital thermometer. Tapping into the smartphone’s power, processing and display also means there are virtually no electronics inside – and no batteries are required – so the thermometer is extremely lightweight and durable for carrying with you, and is always ready for use. If you don't have one already, sign up for a free Swagbucks account. Next, follow this link to get $5 off the Kinsa Smart Thermometer - $19.99 instead of it's regular price of $24.99. Don't worry, shipping is completely free within the US and there are no reoccurring payments. As I mentioned earlier, the associated Kinsa App is also free. Once you complete your purchase, Swagbucks will give you 2000 SB, enough for a $20 PayPal gift card and only 200 SB shy of a $25 Amazon card. That's a pretty good deal, right? Buy a $20 Smart Thermometer and get a $20 in PayPal cash. It gets even better for those of you new to Swagbucks. Earning 2000 SB in one go is more than enough for you to get a 300 SB April Three Pour All Bonus (awarded on May 5th), netting you 2300 SB, worth a $25 Amazon or Target gift card and only 200 SB short of $25 PayPal cash. All that bonus might make you forget you're getting a state-of-the-art Smart Thermometer in the process! Mother's Day By The Numbers: What Mom Wants! Luvs & Ibotta is Happy to Share the Luv!